These webs are a bit of a tangled mess but are very interesting and effective in a way completely different from the famed orb webs. Redback Spider webs are constructed between two surfaces, in a place that is warm, dry and sheltered, frequently in urban areas. The spider itself lives at the top of a kind of funnel of apparently haphazard strands of strong silk. From this, an assortment of lines are stuck to the ground below. These are sticky and taut. Insects walking around become stuck to these strands and begin to struggle. 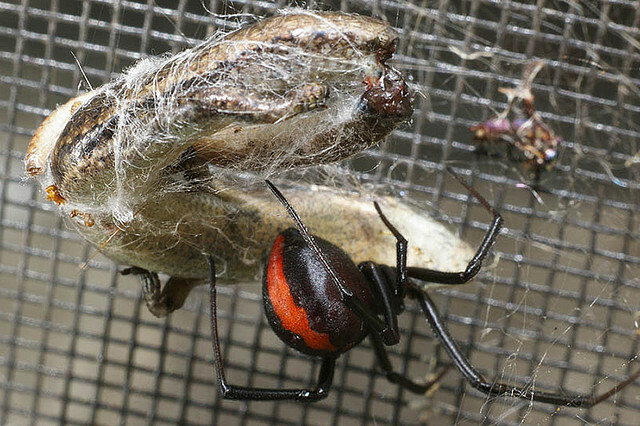 This creates vibrations that tell the Redback that prey has been captured. She might go straight down and haul it in if she wishes or she can take her own sweet time about it. Either way, the struggling can also cause the strand to become unstuck. It's so taut that this causes the insect to be hoisted off the ground, legs reeling in futile desperation until the Redback pays due attention. 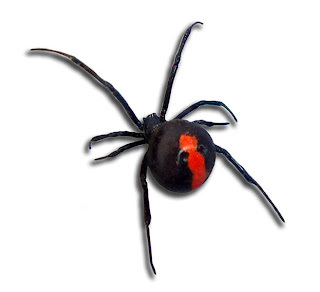 Redback spiders are only about 1 centimetre long, not including legs, but their web design means that they can catch things much bigger than themselves. This even includes lizards and small snakes. Ghastly. As is the done thing amongst spiders, venom is used to paralyse or kill prey while enzymes are injected to liquefy the insides so it can be sucked up like a warm, disgusting milkshake. We have to talk about that venom. Redback Spiders belong to the Latrodectus genus - the Widows. Redbacks are one of the more infamous creatures in Australia. Neurotoxins in the venom causes pain, swelling, nausea, vomiting, fever and sometimes death. The young and the old are at most danger of severe symptoms and deaths are actually very rare, but since they live in close proximity to humans and are so small, there are hundreds of bites every year and many require medical attention. A very effective antivenom is easily available but thankfully, more routine treatments are often enough to ease the effects. Clearly, there's something else about that "Widow" name. 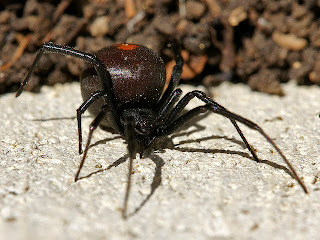 Male Redbacks are a bit under half the size of the female and look much less dramatic. He lives to mate, and will actually die soon after he's done so. Perhaps that's why he actively assists the female in eating him while he mates? Yeh, he WANTS to be eaten and will shove is abdomen toward his Mistress' fangs in order to make his dream come true. In the weird world of arthropods, this allows him to mate for longer than he otherwise could and, as if in remembrance and gratitude, it increases the chances that the female will reject the advances of other males. The female stores the sperm for as much as 2 years, laying a couple hundred eggs every month or so. These are kept in an egg sac which she defends, probably quite well, too. Once hatched, spiderlings extend a thread into the air until they are carried off by the wind to lands unknown. eek! i wouldn't be keen on that either!!! we have black widow spiders here and they're nasty enough, thank you! You didn't mention why they're called "toilet spiders!" They actually like to live UNDER TOILET SEATS, so you can imagine where most of those annual bites actually are. Makes me wonder how many go unreported. I've also read that they might not actually be native to Australia! We aren't entirely sure WHERE they came from. My personal theory is that they came to Australia for the annual convention; everything else there is horrible and poisonous too. It is always a wonder to me that the prettiest of a type of animal are the most dangerous. 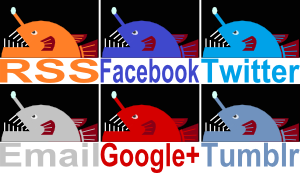 @texwisgirl: They're closely related, too! I can't decide whether that splash of red makes them appear more or less sinister. @Crunchy: I could well have mentioned the Toilet Spider thing, I'm at ease not thinking about it too much, though! I've also heard about the non-native thing, but I haven't heard of where they actually WOULD be native to, or how clear the evidence of any of it really is. It's certainly an interesting thought and yes, Australia seems to be utterly teeming with murderous horror!